Kenzo Fresh Street Foods is located at the entrance of Parc Arcade when entering off Gawler Place. 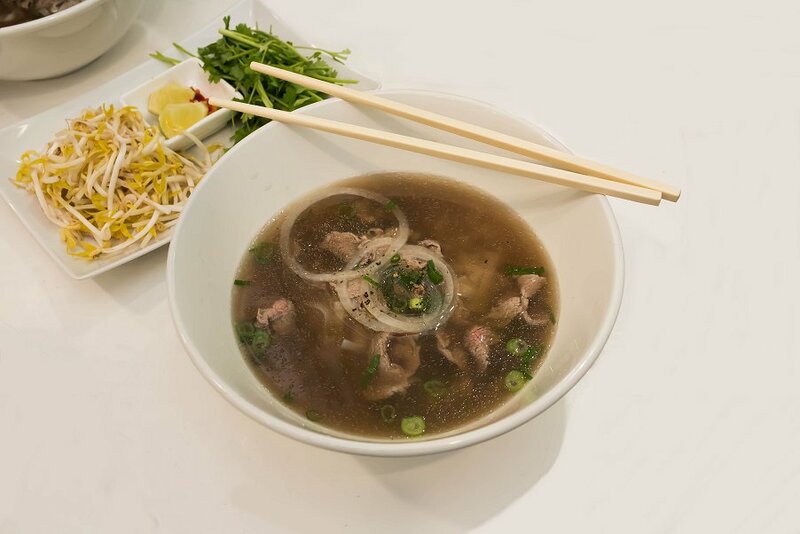 Serving up popular Vietnamese street food, customers can choose from banh mi, noodle salad bowls, beef noodle soups, chicken dishes and a range of snacks. Today, we went for the Rare Beef Pho. The Beef Noodle Soup comes in one size but the bowl itself is a lot larger than what you get. You can’t help feel that you’re being short changed when the dish arrives at your table. The meal comes with a selection of Asian herbs, none of which looked fresh. A single lemon wedge was cut into two which was a bit conservative. The dish itself wasn’t much better. The broth tasted very diluted and a bit on the sweet side. The noodles were all gluggy and stuck together. The rare beef slices were lean and tender, and there was a fair amount. It’s not the worst pho dish I’ve ever had, but it could have been a whole lot better. The cost of the Rare Beef Pho was $10 which is roughly what you’d pay in the western suburbs. Pretty good value considering you’re getting it in the city. The dish itself wasn’t that great and you may find yourself having a second lunch to get satisfied.